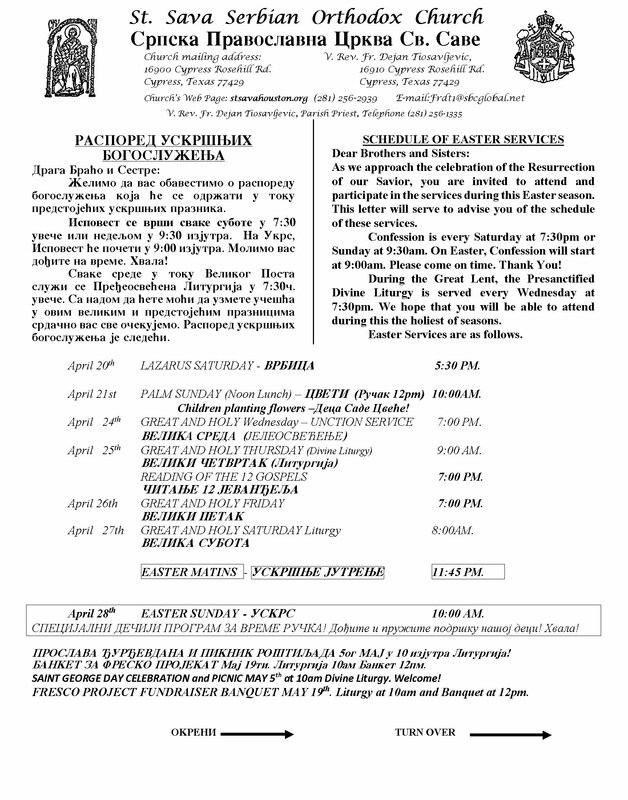 We welcome you all every Sunday at 10 am Divine Liturgy and our Sunday Lunch at Noon. Bring your children to our church school to be together and to learn about God. Every Friday we have Family fun Night with fun for kids and adults 7pm to 11pm. We serve dinner and refreshments. Welcome! We are happy to see you all! Thank you! 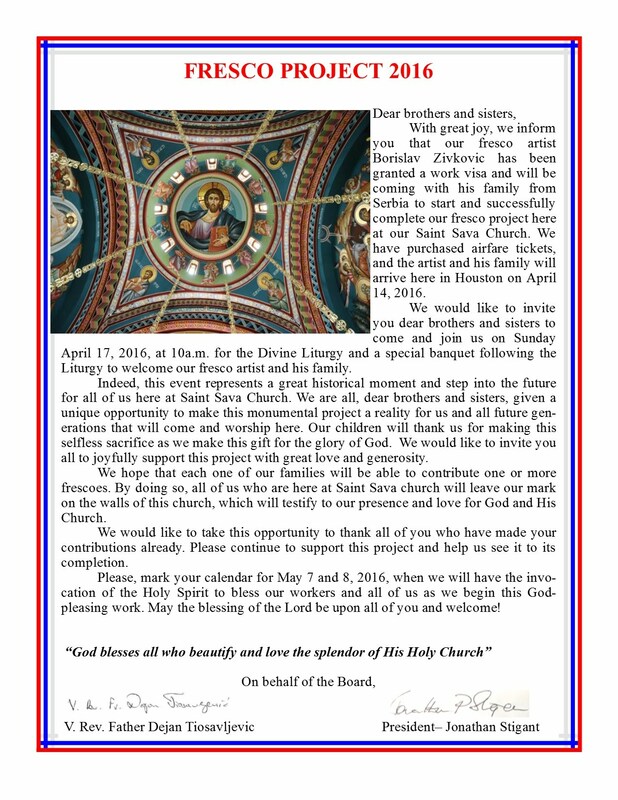 Thank you very much for your generous support of your St Sava Church fresco project. If you have pledged your support, we encourage you to complete this pledge as soon as you can. If you have not already pledged and would like to do so, there is still time. As the project draws to a close, we will be starting to put together the commemorative plaque and plans for the consecration and blessing of the frescos. May God bless us and make this an everlasting remembrance of our efforts to build, complete and beautify our St Sava Church! If you are able to come to church on Sunday you can make your donation at that time as well. We are not able to accept credit card donations. Thank you very much for your prayers and support. ДОБРО ДОШЛИ У ЦРКВУ СВ САВЕ! ROASTED PIGLET for Christmas, the price is $13.00 per lb. Whole piglet $375 or half $250. Please call at 281-256-1335. IF NOT NOW, WHEN? IF NOT YOU, THAN WHO? THEIR FAITH, TRADITIONS AND CUSTOMS. WE ARE LOOKING FORWARD TO SEEING YOU ALL HERE! ADULT RELIGIOUS EDUCATION CLASS AND AKATHIST PRAYER Every TUESDAY Akathist AT 7:30 pm. Class at 8pm. WELCOME! ВЕРОНАУКА ЗА ОДРАСЛЕ И АКАТИСТ БОГОРОДИЦИ ТРОЈЕРУЦИЦИ СВАКОГ УТОРКА - АКАТИСТ У 7:30 УВЕЧЕ И ВЕРОНАУКА У 8 УВЕЧЕ. OUR SUNDAY LUNCH STARTS AT NOONWELCOME! OPEN YOUR SOUL, YOUR HEART AND YOUR MIND TO GOD! 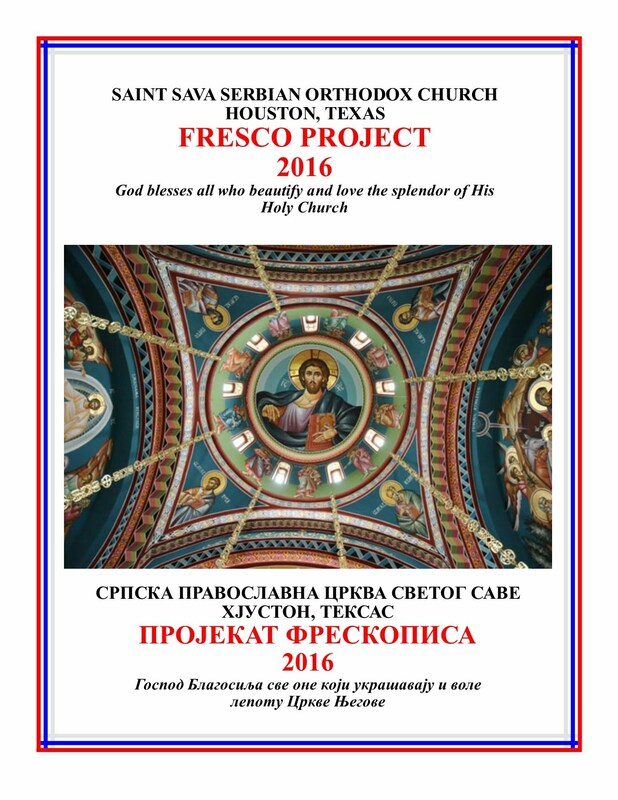 PLEASE SUPPORT OUR FRESCO PROJECT-MAKE YOUR OFFERING TO GOD AND SAINT SAVA! WELCOME TO ST. SAVA CHURCH ДОБРО ДОШЛИ У ЦРКВУ СВ САВЕ! 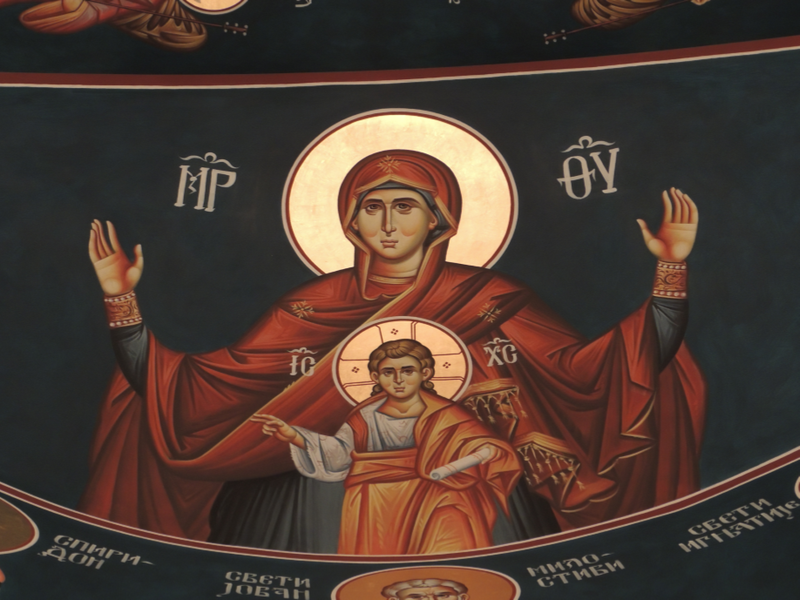 Feast Days during the week: eve day Service 7pm and Divine Liturgy at 8am. REGULAR IN WORSHIP REGULAR IN PRAYER AND REGULAR IN GIVING! 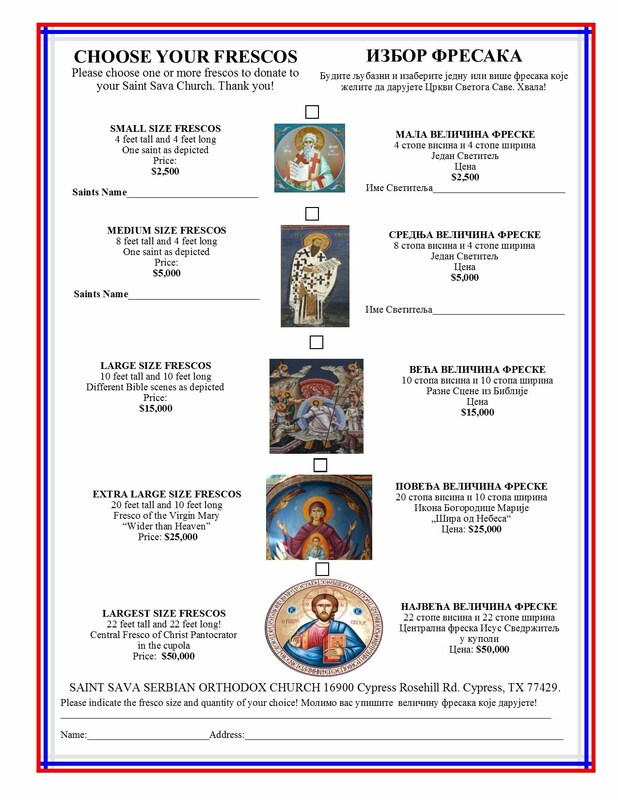 WE THANK YOU ALL FOR YOUR ST. SAVA CHURCH CONTRIBUTIONS. THE BENEFIT OF OUR CHILDREN AND GENERATIONS TO COME. FOR YOUR CONVENIANCE THERE ARE SEVERAL EASY WAYS TO MAKE YOUR REGULAR DONATIONS. WE THANK YOU AGAIN FOR DOING YOUR PART. THEN, YOU CAN MAIL IT OR USE YOUR ONLINE BANKING TO CONTRIBUTE TO ST. SAVA CHURCH. CYPRESS, TX 77429 AND THEN CHOOSE THE AMOUNT AND FRIQUENCY OF YOUR CONTRIBUTIONS. TO CONTRIBUTE USING YOUR CREDIT CARD PLEASE CALL US AT 281-256-1335. YOU CAN ALSO E-MAIL US AT FRDT1@SBCGLOBAL.NET AND WE WILL PROCESS YOUR DONATION. WE THANK YOU FOR YOUR DONATIONS! MAY GOD GRANT YOU ONE HUNDREDFOLD IN HIS RICHES! Whole piglet $300 or half $200. Lamb $400 whole or $300 1/2. Call at 281-256-1335.
for our 25th Anniversary. Thank you all who contributed for this wonderful project. Please welcome to visit and see our new windows. God bless you!